Excellent Dish Mat for Your Kitchen! Difficult to dry your dishes? Need something to protect your counter-top from hot jar? We have the solution. 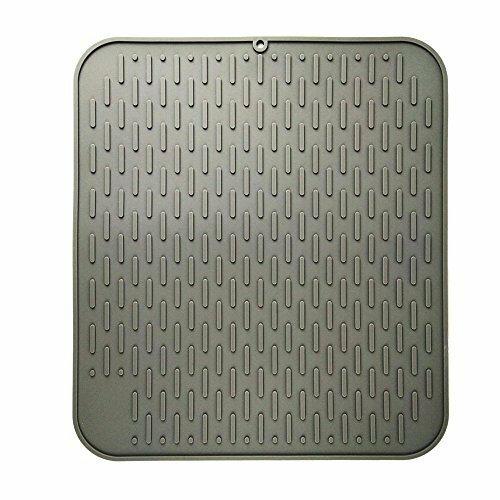 Dish Drying Mat (TM) is a large silicone mat that can be used for dish drying, trivet, pot holder, counter-top protector or even a jar opener. Multipurpose usage for plates, glasses, pots or other kitchen tools or even kids toys mat. Quick Dish Dry and Counter-top Safe Guaranteed! Get this super versatile mat and make your dishes hygienic and dries quickly while protecting your counter-top from hot jar. ONE MAT FOR EVERY DRYING TASK - This awesome mat can be used for dish drying, trivet, pot holder, counter-top protector or even a jar opener. Multipurpose usage for plates, glasses, pots or other kitchen tools or even kids toys mat. PREMIUM SILICONE - Made from premium non-toxic silicone, this mat prevents mold, mildew or germ to grow. It is also extra durable and able to resist heat up to 450F! SPEED DRYING FEATURE - The surface of this drying pad is specifically designed with spaced ridges. It allows water to evaporate rapidly so your dishes & cookware can dry faster! EASY STORAGE AND CLEANING - Dish Drying Mat (TM) is very easy to store, just roll up or hang up while not in use. Easy cleaning with a damp cloth or toss it into the dishwasher. If you have any questions about this product by Dish Drying Mat, contact us by completing and submitting the form below. If you are looking for a specif part number, please include it with your message.